"This tabouli recipe is different. 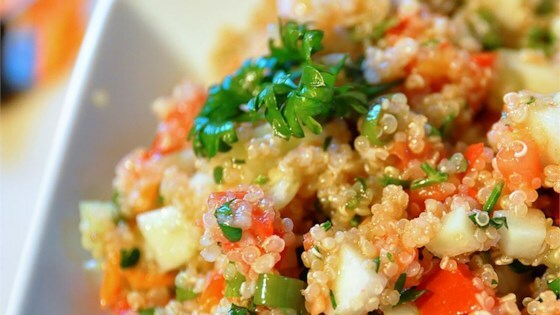 Instead of using bulgur like traditional tabouli, this recipe uses quinoa. It is a grain that is available at health food stores. It looks and tastes better than bulgur. My husband and I both love this and neither of us is vegetarian. It's a great meal for a hot summer day. The longer it sits the better it tastes." Quinoa stands in for bulgur in this healthy, deliciously different tabbouleh.